A revolutionary new approach to more youthful skin. STIMULYSIN® is the only treatment in the world designed to stimulate both the epidermis and dermis through a package of unique ingredients, delivery system and application schedule. The once a week treatment increases the basal proliferation rate without interfering in epidermal differentiation and promotes antimicrobial peptide formation. STIMULYSIN® is Tomorrow’s Technology Delivering Results Today®! Our mission is to partner with our associates in providing superior products along with education and solutions that exceed the current limits of conventional anti-aging skin care therapies. 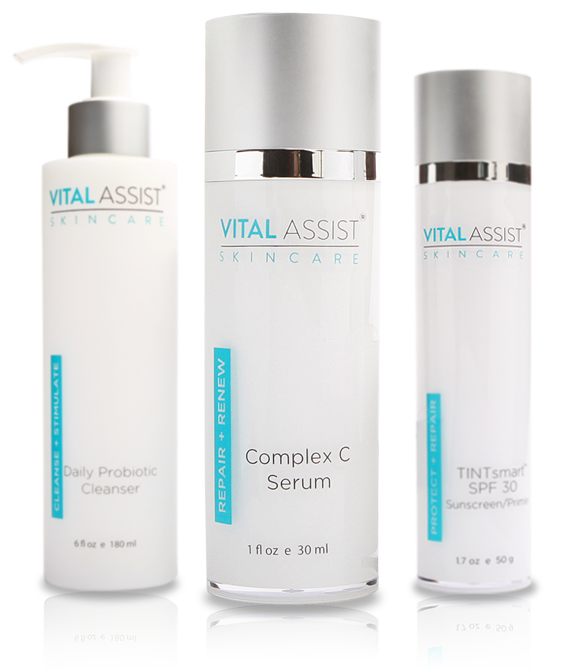 Vital Assist, Inc. is a company with years of expertise in developing, formulating and manufacturing proliferative topical skincare products. The Vital Assist® brand’s association with renowned cosmetic dermatological scientists of Owen Biosciences, Inc. insures its clients that they have a trusted partner in developing and efficacy testing the latest in technologically advanced skincare treatments. © 2014 Vital Assist. All Rights Reserved.